When I was about 8 years old, a new family moved into the apartment building next door. The father was a large, imposing Samoan man and the mother looked like a lovely Tahitian beauty. Our new neighbors operated one of the two bars in our neighborhood. I can't recall the name of it, but it was a small bar on Union Pacific Avenue. The couple had 4 daughters, including a girl about my own age who was named Claudia. The youngest daughter was always called Baby, even though she was probably about 5 years old. I don't know if Baby had any other name, because nobody ever called her anything else. Claudia and Baby told me that their father was a wrestler. A wrestler! How glamorous and exciting a profession that must be! Thanks to my dad, I was an avid spectator of professional wrestling, or lucha libre, as it is known in Mexico. I had grown up watching Blue Demon, Mil Mascaras and the original wrestling movie star - El Santo - battle vampire women, zombies and satanist cults. We watched wrestling on TV, broadcast live from the Olympic Auditorium in Los Angeles as well as lucha libre bouts from the Arena Coliseo in Mexico City. Some of the Mexican wrestlers worked the American circuit. 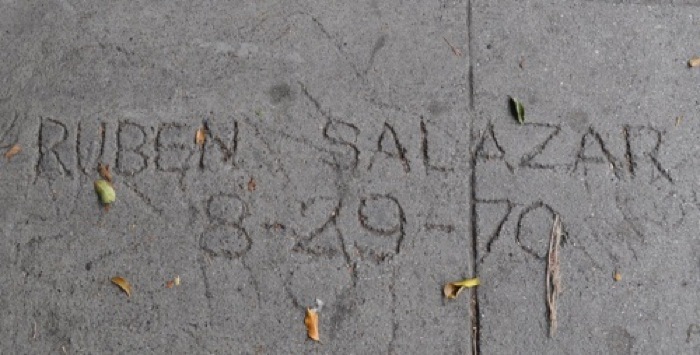 In Los Angeles, some matches were designed to appeal more to lucha libre aficionados. I always found the Mexican bouts more colorful and eclectic than the American wrestling match ups. On lucha libre nights, it was not unusual to see women's wrestling or little people on the bill. Many of the costumes rated high on the tacky scale but I always thought of that as a plus. Matches were not just for a title; titles were for ordinary athletes. Luchadores were more than athletes - they were real life superheros with near mythic status. They didn't just stand for might and brawn, they often championed causes. Their matches were for higher stakes than a trophy or a belt; a masked wrestler might risk his anonymity by staking his mask against another man's prized Samson mane. But it was not just the hair or the mask that would be lost by the defeated wrestler, it was seen as a blow against whatever cause the wrestler stood for. Heroes like Ray Mendoza stood for the indigenous underdogs, the Indians throughout Mexico who made up the poor and often marginalized lower classes. In Mexico, to say someone looks or behaves like an "Indio" was considered an insult, akin to being called a savage. It was widely rumored that Ray Mendoza was illiterate, but instead of that being a source of shame, it was seen by his fans as a sign of how far one could rise despite the lack of a formal education. El Indio, Ray Mendoza, was one of my childhood idols. Ray Mendoza had been a rudo who turned technico (aka scientifico); a bad guy who turned good. He always kept the rough edges of a rudo, but being 8 or 9 years old, I didn't need to do a lot of analysis of what he stood for; El Indio was clearly for the common people. His brown skin and long black hair were a source of pride for him and for his fans who saw a bit of themselves reflected in this powerful wrestler. I had the opportunity to see Ray Mendoza fight a bout in which he wagered his long, Indian locks. My parents and I went to the Olympic Auditorium that night to cheer on our hero. The place was loud, raucous and the crowd was fired up. Ray's fight was the main event. I wish I could tell you who he was wrestling but I don't remember because it didn't matter. Ray fought valiantly in what turned out to be a very bloody brawl. We shouted and cheered him on until we were all hoarse but in the end, he was defeated. As soon as the winner was announced, a chair was dragged into the middle of the ring and Ray's beautiful long black hair was cut off, right there in front of the packed audience at the Olympic and thousands of fans watching at home. I was nearly in tears. My hero had lost. Through this seemingly vapid sport of lucha libre, I learned to understand the concept of duality at an early age. It was the same kind of duality that I experienced when I realized that I both loved and hated my father, that a "rudo" - a villain - could also be a good guy. It was as much a part of Mexican culture as eating a sweet apple with salt and chili, or celebrating the bleak inevitability of death by making brightly colored sugar skulls with your name on them. Claudia and Baby's father turned out to be a completely different type of wrestler. He was an athlete, not a superhero. I, on the other hand, was a daughter of duality, a violence girl wanting both to destroy and coexist with love in a wrestling match that would last for years. "En Nicaragua, Jesus carga un fusil." "In Nicaragua, Jesus carries a rifle." Photo taken in Nicaragua by Alice Bag. I soon realized that nothing in my relatively comfortable upbringing had prepared me for the reality of living in a country at war. The pops of automatic rifle fire in the distance were almost as common as the clucking of the hens and roosters that woke me at sunrise. Nevertheless, I quickly fell into the rhythm of the household with the warm support and encouragement of my new family. The three regular meals each day were invariably beans, tortillas and a thick, muddy coffee. You could count on eating the same thing pretty much every day, but on special days, we'd have a dish called Gallo Pinto, which was just red beans and rice; sometimes a bit of queso fresco would find its way onto the table. After a few days, I decided to rescue the family from our culinary monotony by going to the market to buy some groceries I could contribute to the household. After all, I'd been in town for three days and hadn't spent any money at all, which was an unfamiliar feeling. When I got to the store, I noticed that many of the shelves were empty. There were some bottles of hot sauce, dry beans, dry rice, a small selection of ugly looking vegetables, a few household items and not much else. Everything was inexpensive. I asked the woman behind the counter about the scarce selection. She informed me that when something was in stock, it was priced cheaply enough that anyone could buy it and so it would sell out quickly. The very idea of setting the price of groceries based on the law of supply and demand was counterrevolutionary to her. I understood her ideology but I still didn't fully understand the empty shelves. "The US has declared an embargo against us, but they will not break us. We'll eat beans forever if we have to." There was disapproval in the woman's voice. "You are a guest in this country. You do not buy the groceries." It suddenly struck me that what I was doing was rude. Who did I think I was, coming to their country, thinking I could buy better food because I had more money? I immediately felt foolish and decided against the groceries, hoping to buy some toilet paper instead. I had brought a roll of toilet paper with me because I knew that it was scarce, but what I didn't know was that it was not only scarce, it was nonexistent. I'd put the single roll in the bathroom and it was quickly gone, to be replaced by little squares of cut up newspaper. I hoped to score a four pack of toilet paper but here again I was thwarted. She looked amused. "No hay." "There isn't any. You need to go back to your family and live like a Nicaraguan," she said, still smiling in a tolerant way. I walked out of the market, my sole purchase a baggie filled with a frozen fruit punch concoction known to the locals as posicle (I thought it sounded like Popsicle.) I bit off the corner of the baggie, sucked on the sweet frozen treat and tried to cheer myself up after being exposed in all my ethnocentric ignorance. I got right to work after that. I made arrangements to visit and deliver supplies to some of the local teachers. School buildings were used for morning, afternoon and evening classes: waste not, want not. The literacy program was open to everyone. Men, women, boys and girls would gather around a few large, mismatched tables. Some people stood for the entire class while others walked in carrying chairs they'd brought from their respective homes. There were men in dirty work uniforms, campesinos with calloused hands who had worked the farms all day and still found time and energy to attend classes, women with toddlers on their laps. They all wanted one thing - to learn to read. Unlike the school books I'd grown up with, here there was no Tom and Jane to read about. These texts were meaningful with stories of Augusto Sandino, Carlos Fonseca and The FSLN. The simple stories were first read for meaning, then broken down into simple sentences; the sentences were then broken down into syllables and finally into individual letter sounds. It was the exact opposite of how it's done here in the US. When I learned to read, I was taken from abstract letters and sounds to concrete meaning; why not start with meaning and then break it down? Going from concrete to abstract was a strategy that made sense to me, especially for second language learners but it also occurred to me that the historical texts we were using to teach people were a form of political indoctrination. They all espoused the revolutionary ideals of the ruling socialist party but the literacy classes inevitably included some open discussion of the material. Did everyone agree with the point of view of the author? If not, why not? Of course, given the circumstances of a social revolution, it would have been hard to disagree with the material or the socialist economic philosophies being taught. I thought about the ways we Americans were indoctrinated by the mass media in our own country and I wondered how much of my own core beliefs and values had been hard wired by my education. It wasn't too long before I realized that what this town needed even more than literacy coaches were strong legs, arms and backs to do the heavy lifting and building for neighborhoods that lacked running water, plumbing and electricity. Since I had no construction skills, I was given the simple task of transporting bricks from the brickpile to a construction site on top of a hill. After my weak arms gave out and I dumped a wheelbarrow of bricks down the side of the hill, the frustrated foreman shuffled me from assignment to assignment until he figured out that I was pretty much unfit for manual labor. "What can you do?" he finally asked. Thinking back to my muralist days at Garfield High, I responded that I could paint. They then assigned me the task of painting seeds with the likeness of Augusto Sandino which they made into necklaces and pins to sell. Some of my handiwork. I didn't do the bad one in the middle. Photo by Alice Bag. The fact that I was bilingual in English and Spanish was also valuable, since they needed to translate documents. I was happy to have found a skill I could use, not realizing that the documents in need of translation were repair manuals for truck engines, sewing machines and power generators. Of course, I didn't know the Spanish words for such technical terms as "flywheel" or "spark plug," so that was a bit of a challenge. I did a fair job of translating the charlas between the community members and the foreign students who had a limited Spanish vocabulary. These weekly meetings helped keep the school at the service of the community. I'd listen and simultaneously translate Spanish to English and then back again. It's harder than it sounds and gave me a real appreciation for the role of translators. I spent a month in Esteli, helping out in some of the classrooms, interviewing people who had learned to read through the literacy campaign and then had gone out to remote villages to teach others, forming youth brigades which fought against ignorance and battled illiteracy as an extension of a social revolution. It was then I realized that teaching someone to read was itself a revolutionary act. I observed and learned as much as I could but mostly I learned about myself and about my government, which had imposed an embargo against the tiny country and was helping to train and fund the contra-revolucionarios - Contras, as they were known in the States, or Freedom Fighters as Ronald Reagan had attempted to name them but even in the US the name Freedom Fighters wouldn't stick. Aside from constant volunteer work, I spent my spare time hitching rides through the Nicaraguan countryside, seeing some of the outlying towns and visiting with the people who lived there but this was no tourist vacation. Once, while walking down a dusty street and talking to a villager, I found myself face down in the dirt when bursts of automatic rifle fire went off just a block away. Being so close to the border with Honduras where the Contras were staging their counter-revolutionary attacks meant that I had to be constantly aware of my surroundings and prepared to duck and cover at the first sign of a gun battle. Every place I went - from the largest city to the tiniest hamlet - had its own personality but they all shared a common vision: to rebuild their war-torn country from the inside out. As poor as these people were and despite the difficulty of their circumstances, I found in their spirit a warmth and generosity that I'd rarely experienced before. I learned by watching their daily example that what was important in life was not wealth nor material possessions, but purpose and resourcefulness. Being in Nicaragua at that time also allowed me to witness firsthand some of the effects of war in a way that was not sanitized for my consumption. Children of Esteli. Photo by Alice Bag. After more than a month of living, teaching and working in Nicaragua, I boarded a flight for the return trip to the States and my job as a schoolteacher with a renewed sense of purpose and dedication. The most lasting impression I have of Nicaragua is of the indomitable spirit of its people. Their hunger for knowledge and self determination would teach me to never be complacent about what I have and what I have to lose. Late in the summer of 1970, just as my summer vacation was coming to an end, the Chicano Moratorium organized a huge march through the streets of East L.A. to protest the war in Vietnam, the many Chicano soldiers who were being drafted and sent overseas to fight it and the higher than average mortality rate among Chicano soldiers. 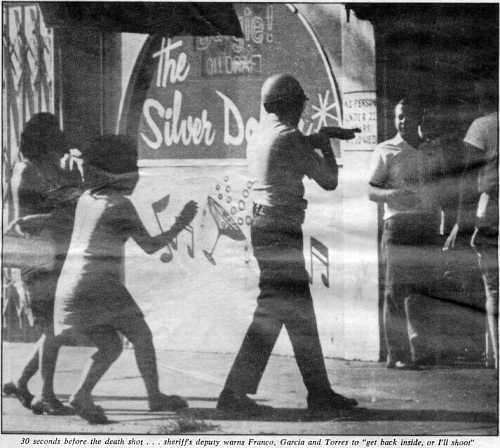 Chicano Moratorium March, August 29, 1970. My father never liked the term "Chicano" because he believed the word was derived from a derogatory term used when he was young and working as a bracero and he did not usually get involved in political demonstrations. This time, he surprised us by volunteering to take us to the march. We parked our car near the 7 (now the 710) Freeway, just a couple of blocks away from Whitter Boulevard, where the march was already underway. We walked up the street and were able to find a spot where my sister and I could see. I think we were expecting a parade but there were just a lot of everyday looking people: mothers, fathers, kids and students with signs, crosses (to symbolize the fallen soldiers) and fists pumping in the air, some chanting "Chicano!" while the onlookers would yell back "Power!" I remember being most impressed by the Brown Berets and being totally dazzled by their coolness. Brown Berets stand at ease. After a while, my sister and I begged to join the march but my father was looking uneasy. The crowd was swelling and we found ourselves being pushed back. My father, sensing something was wrong, pulled us back even further. To my surprise, we saw police cars parked along the side streets. Not ten minutes had passed from when he'd forbidden our participation than we saw a young man throw a beer bottle towards the marchers, then quickly run and disappear into the crowd. There was no one following him but we could see a wave of people push back as he shoved his way through the crowd. I couldn't see where the bottle landed, but I did see the results. Suddenly, people were shoving and yelling. More projectiles flew through the air; one hit the roof of one of the police cars. Panic broke out as the crowd pushed in all directions, trying to get away from the situation. And then, just as suddenly as it had started, it ended as the attackers fled on foot through the crowded sidewalks. A few cool heads tried to calm people down and reorganize the marchers, but my father rushed us back to our car and drove away. As I watched out the car window, I could see the policemen on their radios calling for backup and getting out of their own cars. I thought they might have been waiting until things stopped flying through the air before stepping in, but they didn't seem to be too concerned with catching the people who threw the bottles. I could see parents holding their children's hands and trying to stand their ground as we turned the corner and sped away from the danger. Photo courtesy of Intersections by Daniel Hernandez. At home, we watched the news on TV and we heard that a riot had broken out when a bottle had been thrown at a police officer. From my perspective, it had been a minor altercation and the police had made no attempt to catch the individuals who had been throwing bottles in the first place. A reporter named Ruben Salazar who was favorably disposed towards the Chicano movement and had been an outspoken critic of police brutality had been shot and killed by a deputy sheriff. The riot squad had been called in to clear out the demonstrators, using tear gas and batons, resulting in dozens of injuries and three deaths. I shuddered. remembering the worried faces of parents as they clutched the hands of their kids. I couldn't believe that what had started as a peaceful march protesting a war halfway around the world had turned out to be so ugly. 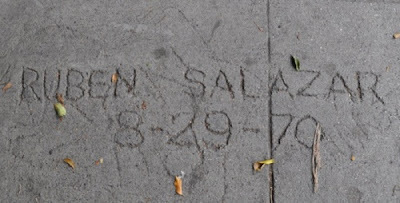 I will never forget that day, August 29, 1970, for two reasons: one was that I had never before realized that I was part of a minority group and I felt good about being part of something as powerful as the Chicano Movement; the other was that this group had enemies who weren't afraid to throw bottles at us or shoot us. Throughout my early childhood, policemen had been the knights in shining armor who had rescued my mother from my father's vicious attacks. In my eyes, they had always lived up to their motto, "To Protect and Serve." That day, I saw my knights like the other people in my life: their capacity for good was matched by their capacity for evil. It seemed that diametrically opposed impulses had to exist for things to make sense. My world was coalescing into a ball of love and hate, trust and treachery. Another deleted scene from Violence Girl. Enjoy! It seems like the whole time I was growing up, the world was trying to teach me the role of women. From the first time I saw my mother cowering at my father’s feet, to the current state of insidious inequality, I’ve been confronted with the message that females are somehow weaker, less capable than men. I began questioning the validity of these messages early on, inspired by the women around me. My mother, my sisters, my friends, aunts and cousins - each one constantly refined the definitions of femininity, androgyny and the true nature of equality in small ways through their daily routines. Sometimes these women discarded antiquated cliches of lady-like behavior in favor of an assertive, can-do attitude. At other times, they tried to squeeze themselves into someone else’s idea of womanhood. Either way, they helped me figure out that the tidy stereotype labeled “femininity” had to some stretching to do to catch up with my evolving female consciousness. Patricia and I learned early on from auditioning male musicians that every one of them thought they were the next Jimi Hendrix or another Keith Moon. While most of the women we auditioned apologized in advance for not being very good, all the males wielded their axes with a bravado that seemed like second nature to them. Even the lamest male guitarist would talk up his skills, acting cocky and confident while the women underplayed their experience. After a bit of this, Patricia and I learned to adapt. We figured that when people wrote reviews about the band, they mentioned the two of us more often than they mentioned the guys. This gave us confidence and after awhile, we learned to do away with the modesty. It felt great to be able to say, “I’m a musician” without feeling the need to tack on an apology. Changing the way we spoke about ourselves as musicians and artists was like tossing tiny pebbles into a sea of conformity, making ripples, making waves, bringing about change that starts from within and spills out into the lives of those around us. The words were so powerful that the more often we said them, the truer they became. Now, when we stepped on the stage we weren’t asking for approval, we were flaunting our talent. 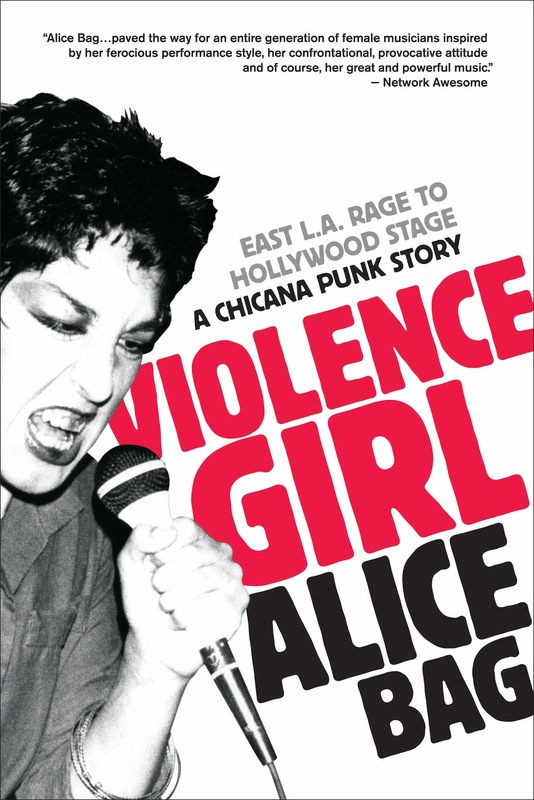 Five Star Amazon review of Violence Girl! "Read this book, it will open your eyes."